Label placement in forms: what’s best? Forms are ubiquitous and a major way in which websites can become interactive. But they tend to receive little design attention – and much of that is spent arguing about details. This talk looks at one of those details: the question of where labels should be placed. 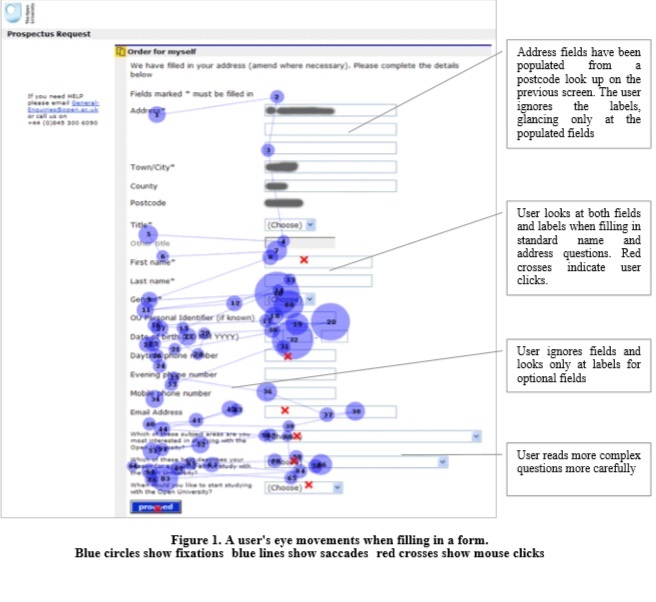 In a much-quoted 2006 article , Mario Penzo reported on some eye-tracking experiments that explored the question of where to place the labels compared to the fields on forms. His conclusion was that placing the labels immediately above the fields reduced the ‘saccades’ (the jumps that the eyes make when reading) and therefore made filling in the form quicker for users. saccades, but not as much as placing the labels above the fields. Penzo clearly states: “our ad-hoc test setup didn’t resemble real-world conditions”. But that has not prevented many web designers taking his conclusions as ‘the right way to do labels’. So what real-world conditions did he ignore? placing the answer on the form. Penzo’s labels included these: “Your address” “Your city” “Company you work for” “Number of colleagues”. These are all rather straightforward questions, all of which pose few problems at any stage of the work of dealing with the form. Therefore, it is possible to argue that the saccade time does have an effect in the overall work. why it is being asked for. So the short ‘Email address’ label often requires amplification with a longer explanation. The consequence of this, and similar real-world problems, is that shorter labels become interspersed with longer ones. If the labels are right-justified, then a mixture of long and short will produce a ragged left margin that is harder to read as there is no predictable spot for the eyes to jump back to – a compromise, therefore, between speed and length of saccade and accuracy of fixation. This would tend to support Penzo’s recommendation: place the labels above the fields. But before accepting that recommendation, we need to think about how users also use labels in other ways. during the completion process, to skip down to the next required field. Both of these are difficult to do if the labels are above the fields. Before accepting any simple design recommendation, we need to think about whether it applies to the users, task, and specific design that we are working on. This applies particularly to the placement of labels in forms, where reading time is only one of the influences. Acknowledgements: The author wishes to thank Ian Roddis, Head of Online Services at The Open University for permission to use eye-tracking data.